The MDJ-600 packs tons of professional features into a compact, cutting-edge digital media player, all without the need for external software. 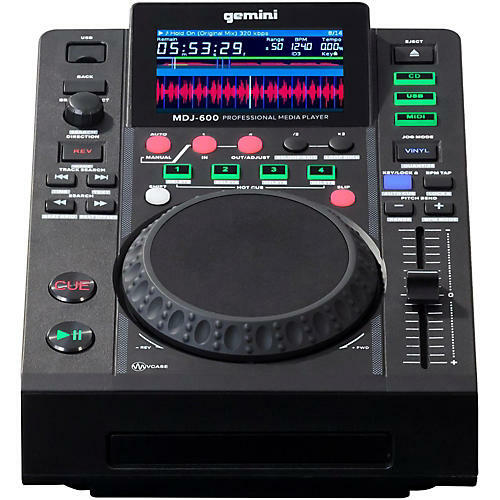 Whether you like to DJ with CDs or you want USB and MIDI capabilities, this versatile player does it all. It’s perfect for anyone who’s trying to break into modern DJing, as well as the experienced DJ looking for a more portable solution. At the focal point of the MDJ-600 is a large, 4.3 in. color screen that provides realtime visual feedback of your tracks. Full track information including title, time, BPM, and pitch are clearly displayed alongside the precise waveform window. Additional visual feedback for slip mode, hot cues and active loops mean you can confidently use scratches or hot cues without ruining your mix. The 100 mm pitch fader ranges pitch from 4%–100%, so you’ll mix with surgical precision. Thanks to the MDJ-600’s intuitive interface, you’ll spend less time deciphering and more time experimenting with the 4 hot cues and 8 auto loops. The 5 in. touch-sensitive jog wheel with LCD display offers adjustable resistance so you can dial in the feel that’s perfect for you. Bonus MIDI capabilities mean you can even control the parameters of your favorite DJ software directly from the unit, routing your audio through its 24-bit/192kHz soundcard. Of course, the MDJ-600 is fully compatible with Gemini’s V-Case Library Management Software, which offers users a faster, easier way to manage their music libraries.